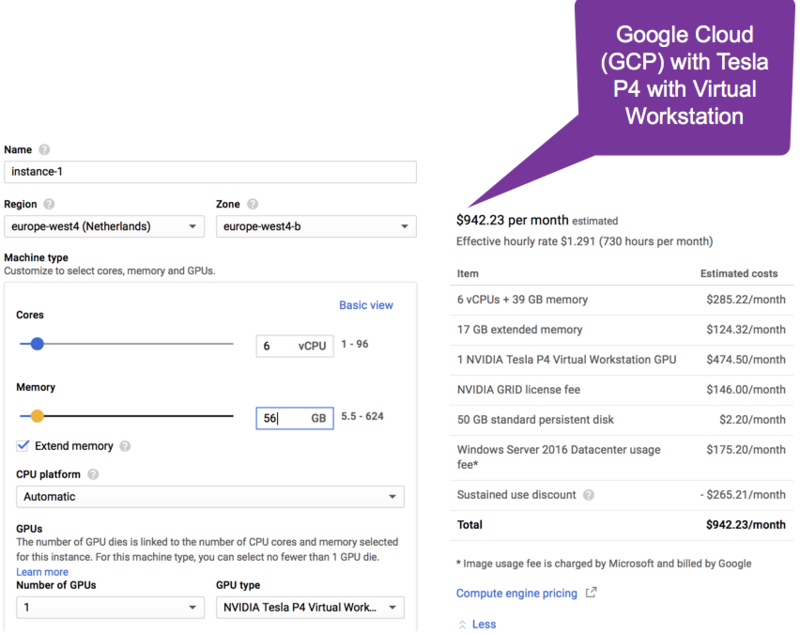 Google Cloud Platform (GCP) now supports the NVIDIA GRID on Tesla P4 and P100 for use with NVIDIA GRID (Virtual Workstation). The P4 and P100 is still BETA which means, this feature is not covered by any SLA or deprecation policy and might be subject to backward-incompatible changes from Google. 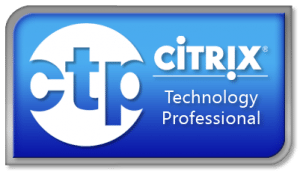 This is great for Service Providers, Partners, Customers that would like to use EUC vendor such as Microsoft, Citrix, VMware, Nutanix (Fra.me), Parallels, Mechdyne, PCoIP, and virtualize workloads that requires a GPU, which can be from a browser, office, CAD, CAM, CAE or video codec. 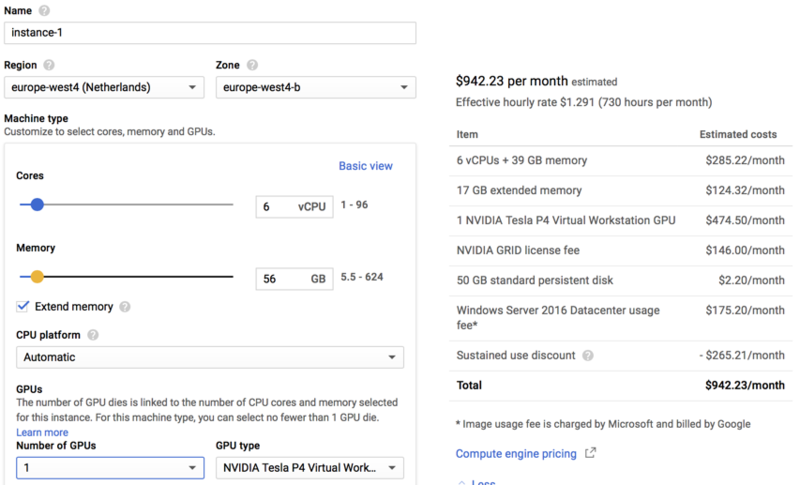 Google Cloud Platform now have NVIDIA GRID available in their cloud offerings. I thought it would be great to give an overview of what the NVIDIA Tesla P4 and P100 GPU are when it comes to Compute and Memory. Lets dig in. You can choose to attach 1, 2 or 4 GPUs to a Virtual Machine. * Maximum vCPU count and system memory limit on the instance might be smaller depending on the zone or the number of GPUs selected. ** GPU prices listed as hourly rate, per GPU attached to a VM that are billed by the second. 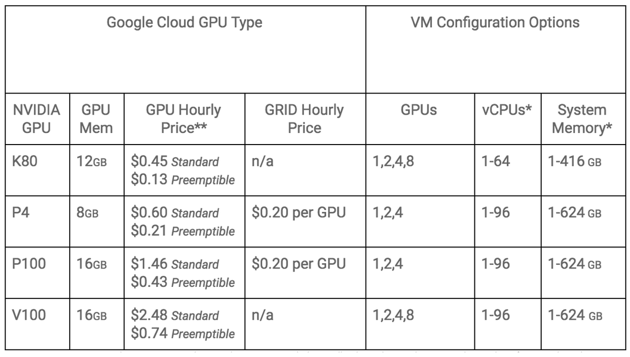 Pricing for attaching GPUs to preemptible VMs is different from pricing for attaching GPUs to non-preemptible VMs. Starting prices listed are for some US regions. Prices for other regions may be different. Additional Sustained Use Discounts of up to 30% apply to GPU non-preemptible usage only. FYI – NVIDIA GRID License hourly pricing is $0.20 per GPU. NVIDIA GRID support only available on P4 and P100 GPUs (beta). FYI – Currently the technology is supported with vDWS and vGPU can’t be used to split up the GPU or usage of vPC. If you have graphics-intensive workloads, such as 3D visualization or video encoding, you can create virtual workstations that use NVIDIA GRID® platform. For background information about GRID, see the GRID overview. When you select a GPU for a “virtual workstation”, an NVIDIA GRID license is added to your instance, and the price is included of the vDWS. You can attach GPUs only to instances with a predefined machine type or custom machine type that you are able to create in a zone. GPUs are not supported on shared-core machine types or memory-optimized machine types. Instances with lower numbers of GPUs are limited to a maximum number of vCPUs. 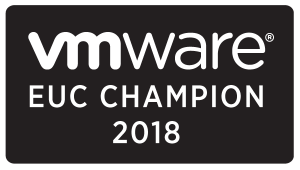 In general, a higher number of GPUs allows you to create instances with a higher number of vCPUs and system memory.Note: If you are using NVIDIA® Tesla® P100 GPUs with more than 64 vCPUs or more than 208 GB of memory, you must use the gcloud command-line tool or the API to create your instance. After you create your virtual workstation, you can connect to it using a PC-over-IP (PCoIP) client, such as Teradici® or VMWare® Horizon View or Citrix Workspace, Microsoft RDSH, Mechdyne TGX, HPRGS or even Fra.me. 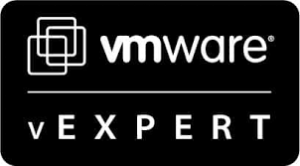 Below I have created a VM in europe-west4 (Netherlands), why well I am danish 😉 and many customers I created daily machines in europe in the clouds. I have added 6 vCPU and 56GB memory and 1 NVIDIA Tesla P4 Virtual Workstation which have 8GB Frame buffer and 2560CUDA. 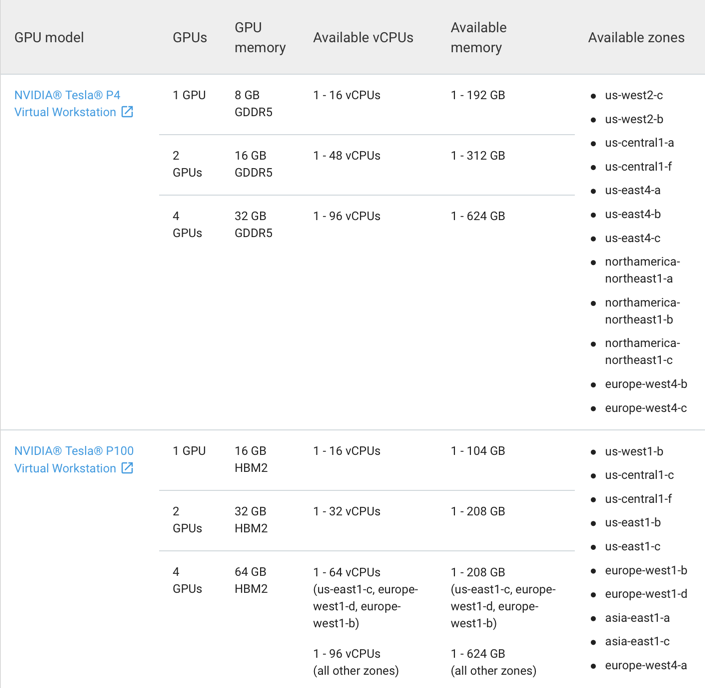 I have made this Virtual machine specification to compare against a popular Microsoft Azure NV6 instance which is pretty equal when it comes to CPU, memory and GPU. You can see that on the right in below picture the detailed price, which component are you paying what for pr month, I like how Google is good at informing the customer what they are paying for pr month pr item. Interesting is that the price is $942,23 per month which is cheaper than NV6 instance from Microsoft. 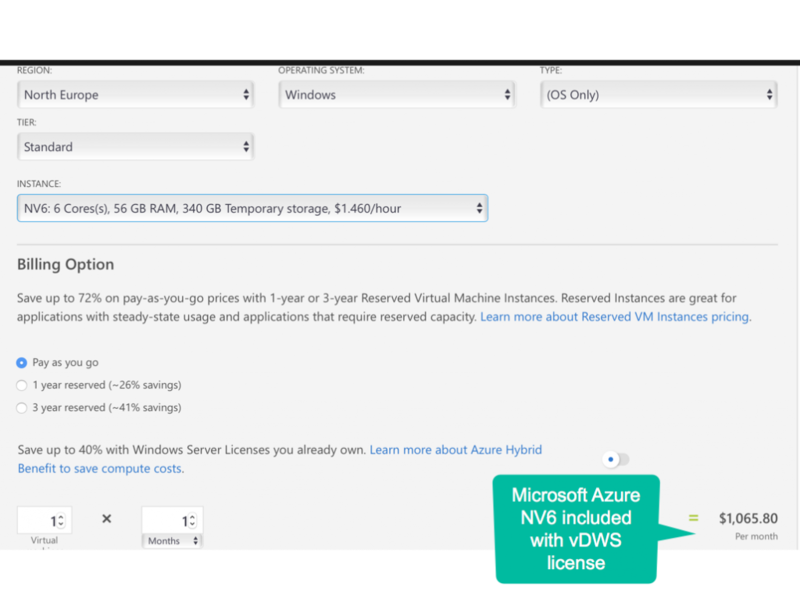 Price at Google Platform is $942,23 per month vs Azure NV6 is $1.065,80 per month …. not too shabby, if you ask me. Customers will get a faster CPU type, memory and faster GPU on Google vs Microsoft. The NV6 is using the half of a NVIDIA Tesla M60 which is 8GB frame buffer and have 2048 CUDA but is using a Maxwell architecture where the NVIDIA Tesla P4 which is on GCP have 8GB frame buffer and have 2560 CUDA and using a newer GPU architecture Pascal. 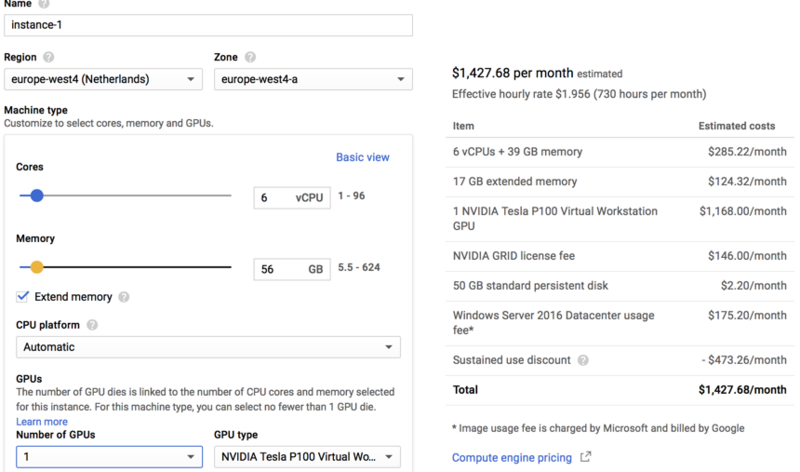 Lets look at the price of the NVIDIA Tesla P100 with Virtual Workstation at GCP. With the P100 GPU you pay more $ vs the NVIDIA P4 Virtual Workstation, what do you get of performance.